In 1825 there were only 25 miles of public railroad open in the world. 50 years later this had grown to 160,000 miles and continued at an amazing pace thereafter. 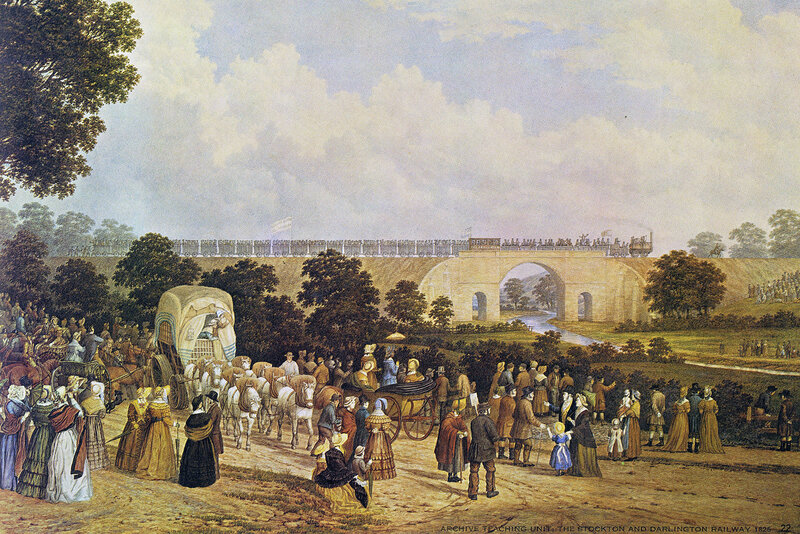 In 1825 there were only 2 locomotives available for use on a public railway, by the turn of the century, this had increased to 70,000.The importance, magnitude and impact of the birth of the Stockton & Darlington Railway on the transport systems of the world cannot be measured.The story has been well documented over the years, however it is extraordinary that it was not until 1875, the jubilee year of the opening that the first historical record was published. The directors of the railway, on such an auspices occasion considered it a suitable time in which to produce the history as a souvenir of the jubilee and fill the most important gap in all the writings of the history of railways. The history by J.S. Jeans was compiled from the records and documents appertaining to the railway company from the date of inception, and in this respect its authenticity is beyond doubt (or is it?). Die Stockton & Darlington Railway Company (S&DR) war die erste öffentliche Eisenbahn, mit der Personen befördert wurden. Darüber hinaus hat sie für die Geschichte der Eisenbahn besondere Bedeutung, weil ihre Gleisspurweite von 1435 mm in der Folge weltweit als Normalspur bei den meisten Bahnen Verbreitung fand. Der Legende zufolge soll daneben die 1435-mm-Spur auf dem Abstand der Spurrillen der bis nach England führenden Fernwege des Römischen Reiches basieren. Die 40 Kilometer lange Strecke in Nordostengland verband die Ortschaften Bishop Auckland, Shildon, Darlington, Stockton-on-Tees und Port Darlington, das heutige Middlesbrough. Die Bahn bestand von 1825 bis 1863 als selbstständige Unternehmung und ging danach im Netz größerer Eisenbahngesellschaften auf.